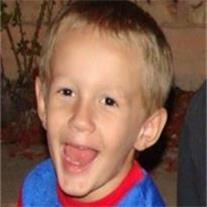 Clayden James Hammond, 5 years old, born February 8, 2007 in Mesa Arizona, returned to his Father in Heaven on June 9, 2012. Clayden was raised in Grants, New Mexico and survived by parents Aaron and Helen, brothers Tyler, Gregory, and Bryn, and sister Amanda. Clayden had just graduated pre-kindergarten and was preparing for a summer of baseball, wrestling, and soccer before his departure. Clayden is remembered by numerous friends and extended family as the little man with no fear and who loved everyone. Clayden will be dearly missed and his laughter will be heard in our hearts until his Savior brings him forth again. Funeral services for Clayden will be held and the Church of Jesus Christ of Latter-day Saints Chapel located at 1852 N Stapley Dr. Mesa AZ on Saturday June 16, 2012. Viewing will begin at 8:00AM, with services starting at 9:00AM. Graveside interment will be at the Mesa Cemetery at approximately 11:30AM. We would like to give a special thank you to the New Mexico State Police, Arizona Department of Public Safety, Mesa Police Department, and all other agencies and organizations that have dedicated so much to Clayden. Thank you.